Again, click here for a link to my old poker blog posts (hosted by Cardrunners). you get to play almost every hand (something like top 85-90%). Any time I’m on FTP and I see Matt “Hoss_TBF” Hawrilenko, KPR16, Quiet Lion, and most other high stakes HU LHE games, I datamine/watch them. I’m trying to model my preflop strategy from Hoss’ (seeing as he’s the winningest online HU LHE player in the world and often regarded as the best). I’ve been thinking about EV/utility/balance and have messaged and emailed KPR16 and TheBryce about some concepts. Specifically, how to play bottom pair type hands OOP on the flop after defending in the BB. I’ve also played a few hundred hands against Polaris (our UofA CPRG bot that we played in the 2008 Man vs. Machine competition in Vegas this summer) on Poker Academy Online. Obviously, I’m getting crushed (although, I’m admittedly running bad). I can’t wait to get much better at 6max LHE so that I can move up and not pay so much of my winrate to rake. 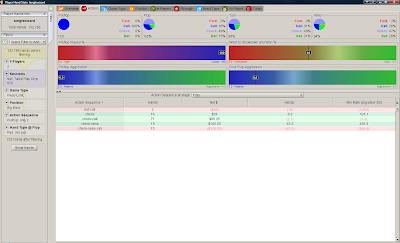 At the lower stakes (up to $5/10 or so), FTP rakes about 2.3 to 3.2 BB/100!!! My winrate for the last month is 0.7 BB/100 and it’s 0.78 BB/100 for the year. Note that I get 27% rakeback, so it’s really like a winrate of ~1.5 BB/100. 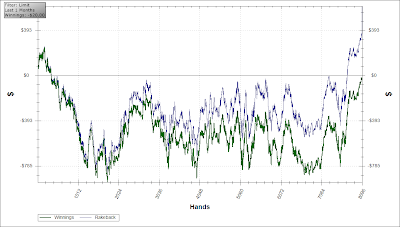 However, without rake this would correspond to a WR of ~3 to 4 BB/100. I’ve been recently playing LAGgier than 30/20 (often 35/25) and while I think this is near optimal in a game without rake, I think playing a more straight-forward TAG style is likely more profitable at the lower limits due to rake. One thing I can’t understand is how I kill $2/4. This year, I’m running at over 3 BB/100 (not even counting rake) and higher if you count HU. One reason may be the sample size (20k hands) but I think it’s just that the players are very exploitable and fold too often. I think a lot of the grinding regulars play $3/6 and $5/10. 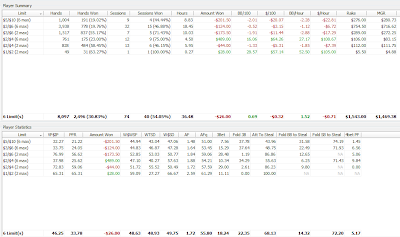 I ran poorly at 5/10 and 3/6 at showdown (W$SD is usually >= 50%) although I was a complete showdown monkey at 3/6. I ran super hot at 2/4 and showed down much less than I normally do (40%). the lower the stakes, the LAGgier I played (both preflop and postflop). I didn’t really play tournaments this month. I entered 10 MTTs total and didn’t cash in any of them. I like not having the binding schedule of MTTs every night that I choose to play. With cash games, I can come and go as I please. When I go back to playing more tournaments, I think I want to play a bunch of 45- and 90-man SNGs (and maybe 180-mans on Stars). However, I might try to satellite into some of the upcoming FTOPS events. There is always a ton of dead money in satellite tourneys. So, October has basically been a break-even month (down ~$60) which isn’t too bad considering I didn’t play too much and my 6max game is a little rusty and I haven’t played much HU before. So, I finally got around to unsubscribing to RealPokerTraining.com. This is most likely the worst poker training site on the internet! I originally signed up only because Chad “lilholdem” Batista had a few videos. As it turned out, he isn’t a very good instructor (although a very very sick MTTer) and the overall quality/environment of the site didn’t suit my liking. Obviously I had to add a new site though. I’m now signed up with a DeucesCracked subscription and I love what I’ve watched so far. The site has a very good reputation and contains coaches/instructors almost exclusively from twoplustwo. In the end, it narrowed down from 133k to 123 hands. This obviously isn’t a big enough sample size (because I haven’t played enough HU) but it can give you some insight as to how [un/]profitable lines are in certain situations. Anyway, I ended up busting by shoving a hand like 76o on the button right after the break as a short stack and the BB woke up with AA. I at least made him sweat a bit on the turn as I picked up something like an open-ended straight draw + flush draw. Although it’s fun to play against such exploitable players, it’s also somewhat frustrating as it means I can’t LAG it up as much as the players are fairly call-stationy. Also, Johnny was on my left and could abuse me if I opened up too much. Another cool thing that is only related to poker because of the person is: Bryce “TheBryce” Paradis (an instructor at Stoxpoker and one of the best HU LHE players in the world, winning about $3M last year) came to my apartment on a Friday night and drank beer and played video games with us. We didn’t up the ante on our standard $5 video game prop bets though. Dave ended up ~$50 as he does on every such night (by pwning us all at Bomberman ’93, Mario Kart Wii, and anything else we decide to play). I don’t think I’ve acquired any new poker books but I did get an introductory book on stocks and another book called “Fooled by Randomness”. I’ve only flipped through these books at the bookstore (that Melissa works at, she got a discount obviously) and haven’t started reading them yet. However, I would like to start learning about the stock market (and eventually invest). However, I think I still need to be doing more. I would like to start using the exercise room (mini-gym) in my apartment complex fairly regularly. Anyway, wish me luck! I’ve rekindled my love for boardgames recently and Melissa and I have decided to alternate purchasing a boardgame every month. This seems like a fairly good rate to acquire new games and be able to play them a bit. I’m uber-happy Barack Obama has been elected President of the USA. I’ve never really been interested in politics but for some reason I became very interested in the recent US Presidential election and have watched most of the “Most Watched – Daily” youtube clips involving the election. I’ve never really had a hero before but I discovered a couple weeks ago that Obama is that hero! I love his speech-delivery, his demeanour, his eloquence, his calmness, his care for the every man, and especially his confidence. However, his confidence isn’t cocky, snobby, arrogant or condescending — it is humble, modest, and selfless. I’m sure he’s going to be great and can’t wait to see what the USA/World will be like in 4-8 years. Take care, thanks for reading, and good luck at the tables! Why exactly are you surprised at the level of play in that apartment poker tournament? I was going to be surprised if there were really strong players there! Board games are awesome. We’re building quite a group of “geeky-gamers” who play board games every week. It’s been a lot of fun. – enjoy your blog quite a bit. looking forward to meeting up to discuss poker as you analyze the number more than i do. – deuces cracked is probably my favorite training site, glad to see you joined up as well. – some of the casino players are probably just above the level of the players you mentioned in your building. Oh, sorry guys, I just realized you guys left comments. Thanks! Awesome, any good board games you can suggest? Also, I agree, Bryce is awesome. Aaron, thanks a lot. We should definitely meet up. DeucesCracked IS pretty frickin’ awesome! Wow, people at that level are playing 1/2 and 2/5? I’ve gotta get myself a live BR.